The Wabbit grabbed the page and took off, reading it. Lapinette flew after him. "That looks original!" The Wabbit smirked. "Maybe it is and maybe it's no." He hopped down the stairs. Lapinette hung over the balcony and tried to see the page. "It's a play," she smiled. "There's a list on the back," said the Wabbit. He read it out. "Knife, sword, firewood." Lapinette's ears swayed. The Wabbit continued. "Ship box, island, dogs ears." "Dogs ears?" yelled Lapinette. 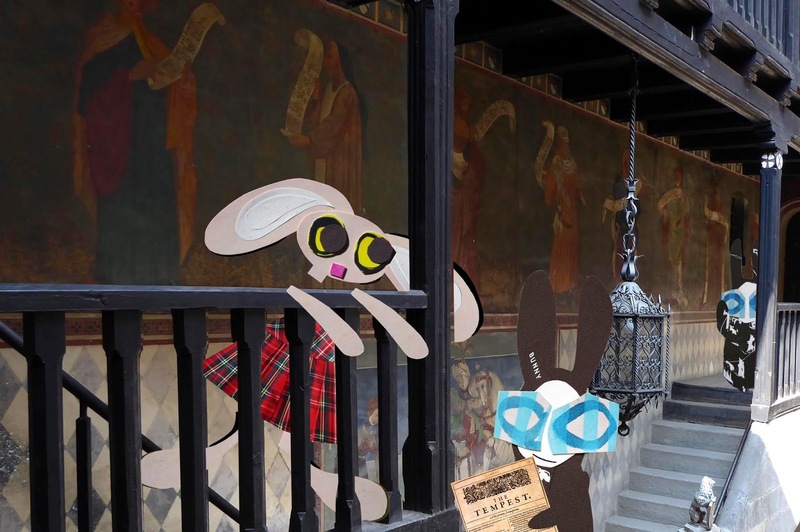 "I think so," said the Wabbit, "the writing's squiggly." He squinted down the page. "Any more?" asked Lapinette. "Fripperies," announced the Wabbit. Lapinette paused to think. "Does the list involve a magic book?" "It's in capitals," nodded the Wabbit. "Then they're all things in The Tempest," murmured Lapinette. She pirouetted. "You were on the stage weren't you?" said the Wabbit slyly. Lapinette fluttered her paws. "Acting is a passport to fun." The Wabbit laughed. "So maybe you could play spy and decode this." Lapinette flew down the stairs and seized the page. Her eyes flew up and down the page and then she turned it over. "The code is in the text." The Wabbit took it back and had a look. "It says we gotta split forthwith." "Our transport awaits," said a familiar voice. The Wabbit didn't turn. "Where are we off to?" "To unpathed waters, undreamed shores," answered Wabsworth.